In its 2018 “Global Rights Index” published on Thursday, the International Trade Union Confederation (ITUC) says that 65% of countries exclude workers from the right to establish or join a trade union while 87% of countries violated the right to strike last year. “The 2018 Global Rights Index saw restrictions on free speech and protests and increasingly violent attacks on the defenders of worker’s rights,” it writes. European countries topped the ITUC global rights ranking, with 10 EU countries featuring in the top 13 alongside Norway, Uruguay and Iceland. 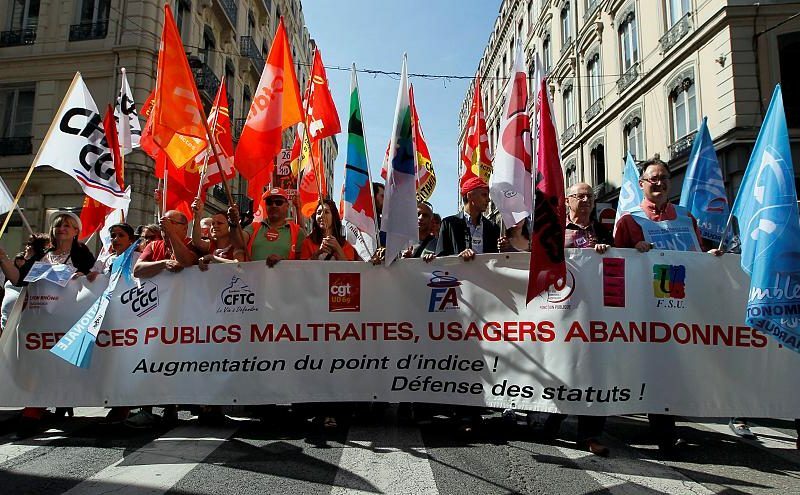 Still, the ITUC notes that the long-lasting negative effects of austerity measures “have all but dismantled existing collective bargaining frameworks” especially in Portugal, Spain and Greece, which were heavily impacted by the 2008 financial crisis. In Spain, the report deplores the use of Franco-era legal provisions to crack down on peaceful strike actions, while in Greece — which was ranked in the bottom 33 countries — the ITUC highlights that the number of occupational-level agreements covering the whole country fell from 65 to 14 between 2010 and 2013 because of austerity measures. Asia and the Pacific is the second-worst region for workers’ rights according to the ITUC, which flagged how physical violence and intimation of workers are common practices to prevent the establishment of unions, particularly in India and Bangladesh. The report also highlights how in Indonesia, Myanmar and Cambodia, numerous cases of workers exercising their right to strike were dismissed. ITUC also denounces China and Korea for their jailing of labour activists and trade union leaders. Algeria, Bangladesh, Cambodia, Colombia, Egypt, Guatemala, Kazakhstan, the Philippines, Saudi Arabia and Turkey are listed as the worst 10 countries for workers. In Latin America, an increase in violence towards trade unionists was reported with 19 trade unionists assassinated in Colombia last year and 87 murdered in Guatemala since 2004. In Turkey, ITUC says the failed July 2016 coup d’état has led to a crackdown on civil liberties and to trade unionists being “systematically targeted under the guise of the state of emergency”. Finally, the absolute worst rating was given to countries, all in the Middle East and Africa, where there is no guarantee of rights due to conflict and the breakdown of the law. These include: Burundi, Central African Republic, Eritrea, Libya, Palestine, Somalia, South Sudan, Sudan, Syria, Yemen.